On Thursday, Feb. 9, District One staff of the Florida Department of Transportation (FDOT) will hold public meetings to present the latest designs for the improvement project encompassing Interstate 75 from south of Bee Ridge Road to south of Fruitville Road. The sessions will be conducted from 2 to 3:30 p.m. and from 5:30 to 7 p.m. at the Realtor Association of Sarasota & Manatee, located at 2320 Cattlemen Road in Sarasota, an FDOT news release says. Each meeting will feature an open house format and will include a brief video presentation that will run continuously throughout the session, the news release notes. “No formal presentation will be held. FDOT representatives will be available to answer individual questions and receive written comments,” the release says. 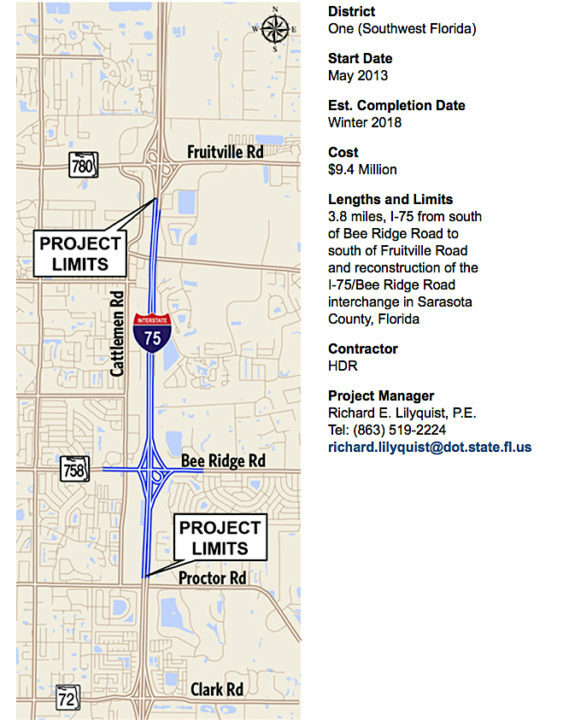 FDOT is preparing design plans for the future widening of approximately 3.8 miles of I-75 and reconstruction of the I-75/Bee Ridge Road interchange, the release explains. FDOT plans to rebuild the interchange, changing it from the existing diamond design to a hybrid diverging diamond interchange (DDI) with a southbound off-ramp to Cattlemen Road. The department also proposes to rebuild the intersection of Bee Ridge Road and Cattlemen Road to make it a continuous flow intersection, the release points out. Persons wishing to submit written statements may do so at the meeting or send them to Richard E. Lilyquist, FDOT Project Manager, 801 N. Broadway Ave, Bartow, FL 33830. Comments also may be emailed to richard.lilyquist@dot.state.fl.us. All statements postmarked on or before Feb. 19 will become part of the public information meeting record, the release notes.